Products tried and proven through twenty two years of use by satisfied orchardists. 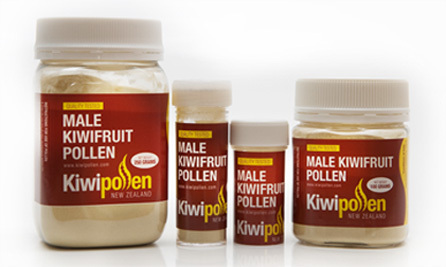 At Kiwi Pollen we pride ourselves in producing high quality pollen with high viability. All our pollen is tested by our trained Quality Manager. Pollen is sampled and grown in a sugar solution in a water bath to measure its germinability. Every batch of samples is run with a control sample to ensure the testing is robust. We have perfected the procedure for collecting male kiwifruit flowers and gently extracting the pollen. We only collect flowers from high performance male vines grown in well-maintained orchards with good vine nutrition. Quality pollen germinates with strong pollen tubes and has good seed setting performance. Pollen purity is assured because our staff collect flowers just before they open, minimizing the chance of contamination by wind and insects. Regular testing of pollen samples to ensure the high viability of our pollen is maintained. This is done by testing pollen tube growth in sugar solutions. Monitoring storage temperatures to maintain pollen at less than -12°C temperatures. Final testing for pollen germination before shipping around New Zealand by fast courier using polystyrene chilly bins with glycol cold packs to maintain consistent low temperatures. Shipping worldwide by "jet service" using polystyrene chilly bins with dry ice and glycol to maintain consistent low temperatures.